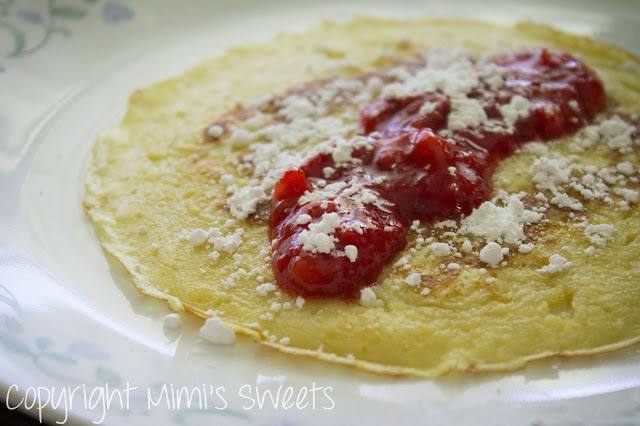 Delicious, French inspired crepes with homemade strawberry preserves and powdered sugar! To be completely honest with you, I have no idea why I decided that I wanted to make crepes. Maybe it was because I had made pancakes recently and wanted something like it, but not pancakes? Your guess is probably as good as mine, since I had only had crepes maybe two times growing up. Anyway, I went looking for a good recipe to try/ tweak... And I found it here. I made a couple modifications, and in making them, stumbled upon a few tips that I'll share with you that I didn't get from the blog that I found the recipe on (but wish I had known beforehand). Tips: If your 8 inch pan curves in at the top rather than gradually getting wider, I would suggest using a 9 inch pan so that they are easier to flip and so that they don't end up too thick; Do not use buttermilk-- I did it once to finish off leftover buttermilk that I had in the refrigerator and the crepes ended up being too thick and a bit slimy; Make sure to let the melted butter cool before adding it to your milk and vanilla, or it will be very clumpy; Butter your pan before starting and then again about half way through making the crepes so they don't start sticking to the pan; Heat your pan up to medium to begin with, and once hot, reduce heat to about a 2 or 3 (scale of 1-10: start at 5 and reduce to 2-3 depending on your stove top) to keep from burning and sticking. When I make them, I put my homemade strawberry preserves and confectioners sugar on them (yes, I even make my own confectioners sugar!). If you prefer savory (like ham and cheese), depending on your pallet, you may want to skip the granulated sugar. These are now a household favorite, and will probably be made on a regular basis considering how quickly they were devoured! Trust me, you will definitely want to try these. They're better than any other crepes I have ever tasted. I hope you all enjoy! If you have any questions or comments, feel free to leave them below. I'll help you out best I can! 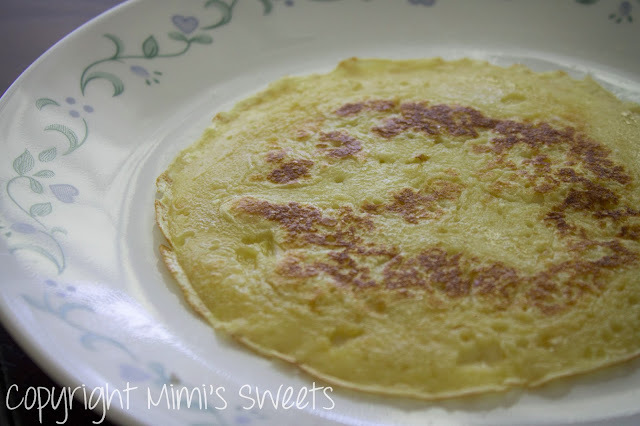 If you enjoy breakfast foods, check out my recipe for Homemade Waffles and Pancakes too. Thanks for dropping by. While you're here, feel free to browse the rest of the website for lots of yummy treats!